A bit of radio silence here. Happy Spring! I finally finished Big Magic by Elizabeth Gilbert. Actually, I thought I had finished it a long time ago; it being started it right after her appearance at Seattle Arts and Lectures. The bookmark was peeking out of it as it was being put back onto the shelf and it revealed there were a few chapters left. Sometimes you read things right at the right time. She talked about following your curiosity in times of creative drought. In this season of child rearing, theater, my chosen creative profession, seems far out of my reach. Inspiration calling on others who are able to answer it. Handcrafts, knitting and sewing specifically, have sparked my interest but it it hasn’t fulfilled me in the way that I expected. And maybe that’s because I’ve been too caught up in product. Somewhere along the line completing a project has become the only measurement of success. The number of creative things completed equates to my ability/productivity/talent. To a certain extent that’s true. I’m both a beginner sewer and knitter and the time to work on projects is so fragmented that most of it is used re-learning what I was doing in the first place. The sweater is being knit one slow row after one slow row. Instead reveling in the fact that I finally learned how to pick up a dropped stitch, the focus is on the fact that it’s been 7 months since it was cast on. It’s hard when your mind works much faster than your hands; when your days are filled with countless worthy (and not so worthy) tasks. I’ve been toppled by a wave where product means everything and process nothing. This is the place where the craft ceases to be easy or rewarding; where it’s harder to push forward and easier to veer away from it- sometimes to pick it up again, sometimes not. PLANDAS sit around all day,planning what to do. Their plans amount to nothing for they never see them through. They plan to run a marathon or take a railroad trip. They plan to cross the ocean on a wooden sailing ship. They plan to learn to roller-skate, to juggle, and to fence. They plan to go to clown school and cavort in circus tents. They plan to play the saxophone and form their own brass bands…But PLANDAS never do these things- they just keep making plans. I finished the hat; still working on the cowl. Plandas are my spirit animal, in a way. Planning lands squarely in my comfort zone: imagination, creativity, grand ideas, courage with basically no risk (aside from a closet full of supplies). And while one might see failure in a plan never being put into place, in this case, failure doesn’t even have a chance. If you never begin the plan it still has worlds of potential. (The trigger can be pulled at at a moments notice.) And thus, you never get to the place where you’re stuck in process without product because you’ve never started in the first place. Ah, but just being a planda isn’t really living. And just quitting when things get tough, when the real work begins, you never grow, learn, discover or improve. To finish the sweater, attempt colorwork, to take another sewing class to complete the dress; to continue to follow this curiosity of handcrafts is where life happens. Yes, it’s easier to plan or start and complete projects that have definite deadlines but much harder to sit in a sea of process. Whether I guide the handcraft projects into the harbor of completion shouldn’t be the only measurement of success. Reading Big Magic served a reminder and encouragement that curiosity is valuable, just in itself. A meditation on the journey. A prompt to think how success is defined. A result, a finished object, is not required every single time a project begins. It’s a balance between planning (dream) process (journey) and result (destination). We can’t be in one spot for too long. A few dreams, a couple of journeys and a handful of destinations, all cycling at different intervals. It’s tempting to cut one or the other short, to camp out in one place for too long or forget to be present in whatever stage we’re in at the moment. The Staple Dress two years in the making. So I guess I’ve been in the process part of my current handcrafts for a little too long and tangled up in what constitutes success. Maybe I’ll start a new project, pick up an old one again (I did just start a sewing lab class) or follow my handcraft curiosity to somewhere deeper. I doubt I’ll ever become an expert knitter, sewer or even theater director. And to be honest, that would be putting a a predetermined measurement of success on my curiosity. But if I don’t allow myself to continue to work, learn and create, no matter what pace or outcome, how will I ever know? There may be a day that I can say: I’ve been knitting, sewing and directing plays for 30 years now! There was a period of time in high school where I raided my dad’s closet. I was into the baggy/skater/slightly hippy look. I cut off old 501’s for shorts and took this rag wool REI sweater from who knows when. I always kept this sweater, long after I realized fitted clothes were much more flattering. This past fall I decided to transform this over sized sweater into a vest I could wear. On the first try I just sewed a few inches in on the sides, following the existing line of the sweater. That didn’t give the fit I wanted so I ripped it out and then pinned a sweater from my closet on to the wool sweater. Then I sewed the outline of the black sweater. For the sleeve holes, I pinned back the sweater material, sewed and then cut the excess fabric to get the best fit possible. 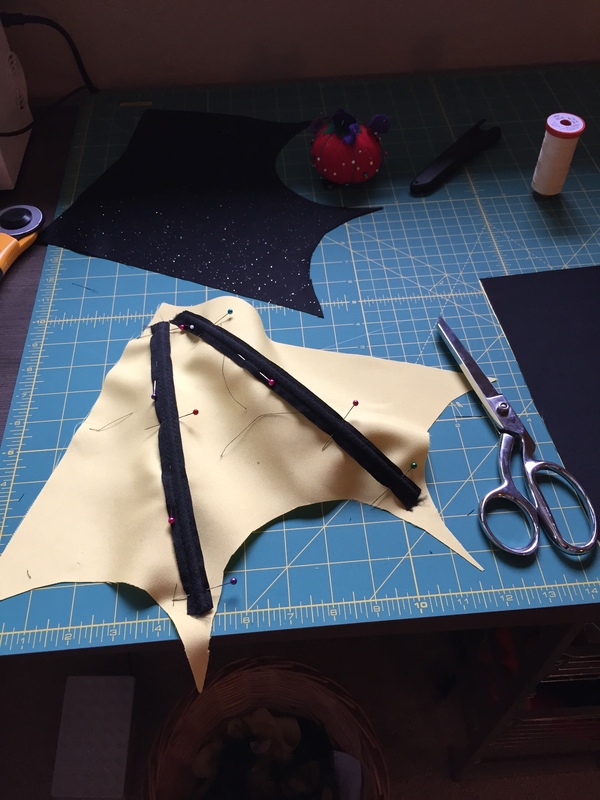 This is my first time altering a garment and it was a relatively quick project once I figured out the shape. I can be pretty nostalgic about things but they do me no good when they sit in a box or drawer. It’s fun to wear this old/new vest, especially with the added meaning that it used to be my dad’s. Plus, it fits into my goal of a mostly handmade, hardworking wardrobe. Triple win! Last year I was gifted a small book, One Thought a Day. It’s a little book where you write a line or two each day for five years. Thoughts were written until March and then it was put down. I picked it up again this new year, to give it another go. It was a surprise that I started writing the same “realizations”, struggles and challenges almost to the day the year before. If my thoughts from last year weren’t written down in the little box, I would be patting myself on the back for the new insights I had, plowing ahead with expectations that the coming year would be completely different. It’s funny, the narrative we play over in our minds and what we forget. This year I set out to knit all my family members a gift. 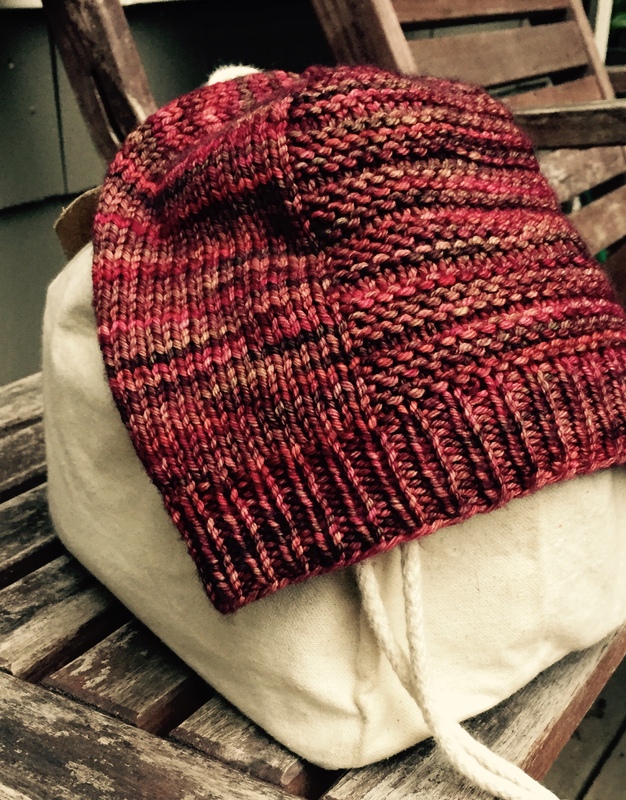 In my planning, I thought what I set out to do was doable: a few hats and cowls. Intellectually, it all was possible- just like all the change I planned with my “new” revelations but in practice it was a whole different story. I knit a lot faster in my mind. There are few interruptions and my fingers move at lightening speed. In truth, I was rushing through the knitting, frustrated that I didn’t have more dedicated knitting time, just in order to finish and get on to the next gift. It wasn’t the relaxing or enjoyable experience I expected. It prevented me from being present with my knitting or benefiting from all the reasons I love it; it became another “to do” on the list. 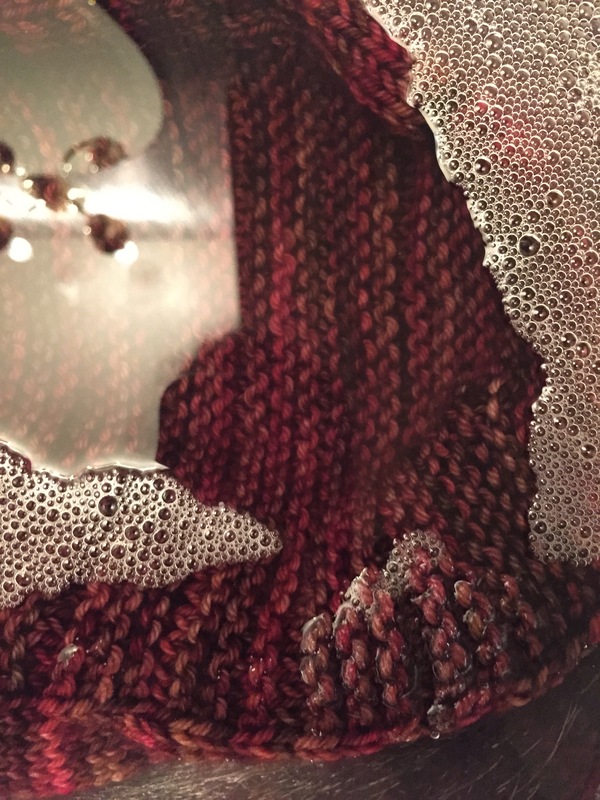 Through my first season of gift knitting and re-reading my thoughts from last year, it’s clear that my expectations have been a bit unrealistic, especially during the holiday season. I want to do all the things: knitting, baking, shopping, cooking, cleaning, decorating, parties and the list goes on. To have all the family gatherings to be relaxing and smooth without conflict or frustration; to participate in every activity with enthusiasm and grace. In what world does this happen? Yet every year, I set myself up for the impossible and then have the hardest time enjoying what is right in front of me. New Year’s resolutions are not something I make every year, and if I do, they’re usually big sweeping statements that are great sounding but nearly impossible to carry out and inevitably fade away by March. This year, however, I will focus on sleep. I figure, lots can come from being more rested…or not (adjusting those expectations!). Some weeks will be better than others. Often it’ll be out of my control (right now it’s 5am wake ups in my house). But I can start small and forgiving and not get caught up in all the things I’d like to change/do (exercise, yoga, de-clutter, less phone time, creative pursuits, reading, travel…). One thing knitting has taught me is if I rush it, it saps the joy from the act of creating. When knitting to finish in order to cast on the next project, I’m not present with what’s in front of me but instead wishing for what I don’t have; always wanting more. Knitting endlessly is not possible. My hands ache and other tasks and people call my attention. Balance is required. It helps remind myself that taking it slow is part of the process; it encourages me to accept where I am at this point in my life. The gifts are still being made and the joy that I have in giving a homemade present is just as wonderful. They can always wear it next winter! And little thoughts are being recorded right before an earlier bedtime- I just hope I make it past Spring. A lot of food was made in the kitchen this last Thanksgiving week: apple cake, turkey on the green egg, roasted vegetables, and chocolate birthday cake. It was a bright celebration of food, family and a little boy. The first few of the holiday gatherings are done. I’d like to say it was a blast but that would be untrue. To say I didn’t enjoy it isn’t honest either. There were moments that I loved, wonderful memories created, but I’m still wondering whether I enjoy hosting or not. Maybe I’m a better support staff person? Perhaps my expectations are unrealistic? This holiday season seems to be one of deeper exploration, teasing out what brings joy and what feels like obligation. Of course, there are many things to consider, least of all is what I, alone, want, desire, need. There is a struggle within myself between the part that wants to be at every party, give every gift and execute all the holiday traditions and the part wistfully imagining a simple, minimal holiday season with just my little family. The truth is that I don’t just want one or the other but a blend of all of the above. And that blend will be different each year. Being in the moment and present is awfully challenging when you’re always thinking about what might be better and how you’d change it. It prevents you from enjoying what is at hand. I know this in my head but it is so hard to put into practice. So hard! To help remind myself and consciously begin to change the narrative of ‘It’s such a stressful time of year’ (because while it can be it isn’t all it is), here are some of the wonderful moments of the past few weeks. And they out number any negative ones by far. Tossing snow on ice. 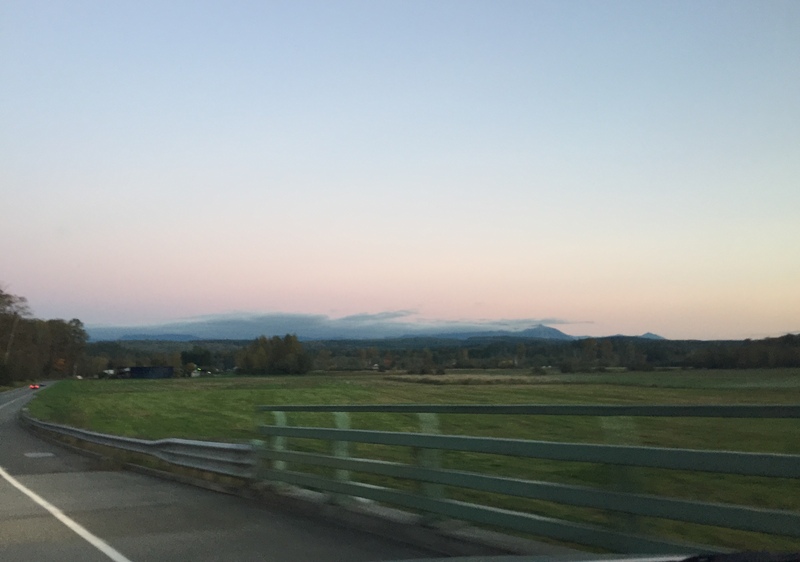 It was a gorgeous, crisp day in the mountains. Birthday crown and new knitted hat. Knitting and I met in my child’s parent and tot class three years ago. The parents made the needles and we wound a small ball of cotton yarn. The needles were huge but smooth from sanding; it was a clunky and awkward start. The “washcloth” has since been unwound and used as play yarn and one needle broke while being a drum stick. Working on the ribbing of my Barley Hat outside. I moved on to making a ribbed scarf for my son and that took about a year to complete. I used the handy I Can’t Believe I’m Knitting to teach myself to cast on, purl and knit. Starting with ribbing was challenging but I finished it. It is around big brown teddy bear’s neck. From the scarf, I decided to try knitting a cowl. The first one turned into a mini shawl (cast on too many stitches and wasn’t using a pattern) and the second one turned out alright. Then I made one for my son (successful and he still wears it) and attempted to make one for my younger son but bound off the edge too tight and made it into a hat. Kind of two steps forwards, one step back and while I liked knitting, I wasn’t quite sold on it yet. This past February, I was yearning for a creative project to keep my hands busy; it’s so helpful in the hours of caring for children. Sewing was great but not portable. Crochet and hand sewing were too repetitive on my hands. Knitting was really perfect and so I pressed on. Another scarf/cowl/hat was not needed and truthfully, I really wanted a sweater. Somehow I remembered a post from Soulemama about the Annabel Cardigan and thought, why not? Inviting a dear friend to knit along with me, together we tackled our first knitted sweater. Along the way we got some wonderful help from Patricia at The Tea Cozy Yarn Shop and we were done by July. Not bad for a first sweater knit in the middle of busy family lives. That was Spring and Summer. Drying; the hat hot air balloon. But I realized by jumping to a sweater, I hadn’t learned some other basic techniques, especially being mostly self-taught, so I took a step back, and took a class at the amazing Tolt Yarn and Wool Shop to learn how to knit a hat, use double pointed needles and pick up a few other tips and tricks. 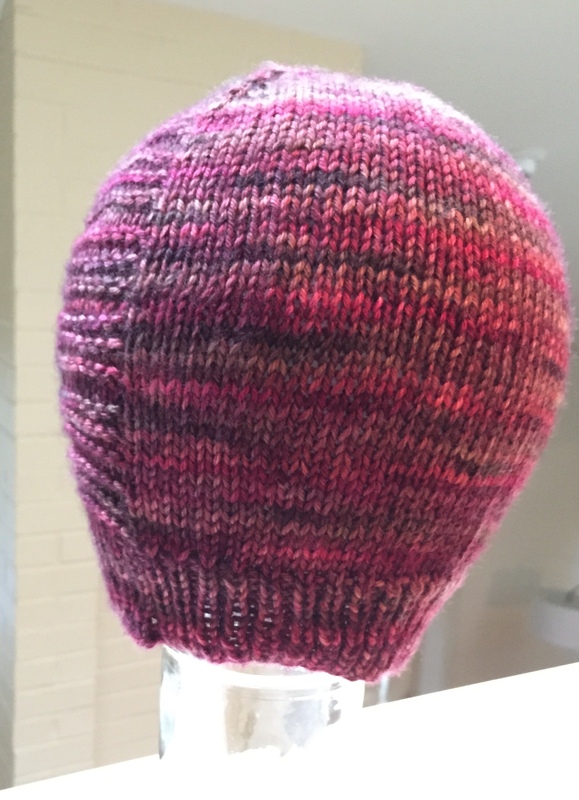 My first hat, the Barely Hat, was a fun, quick knit. I had no idea! 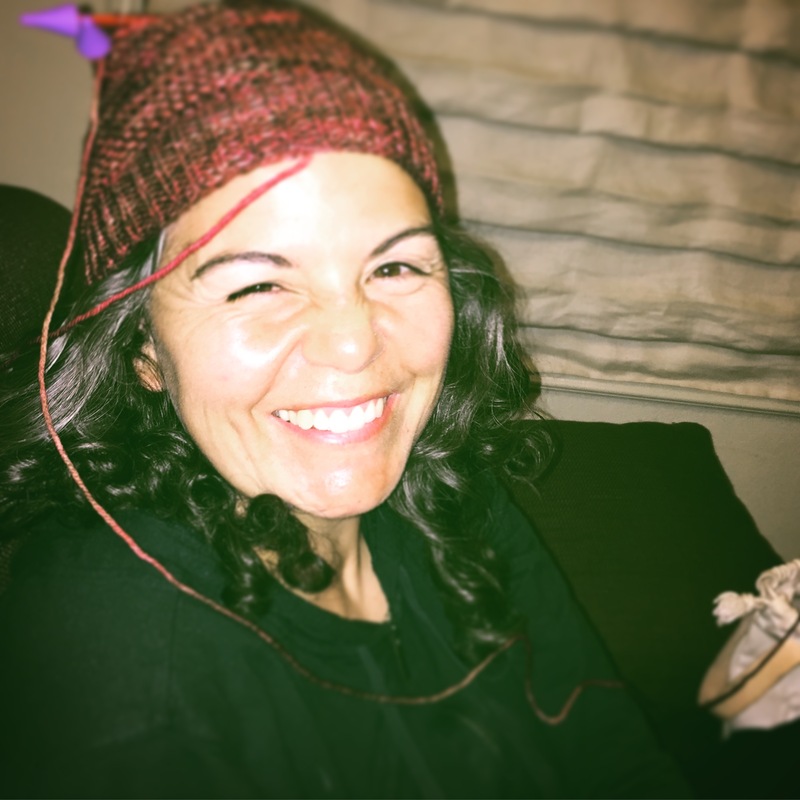 Hats really should be the first project for a new knitter. The details are on Ravelry. 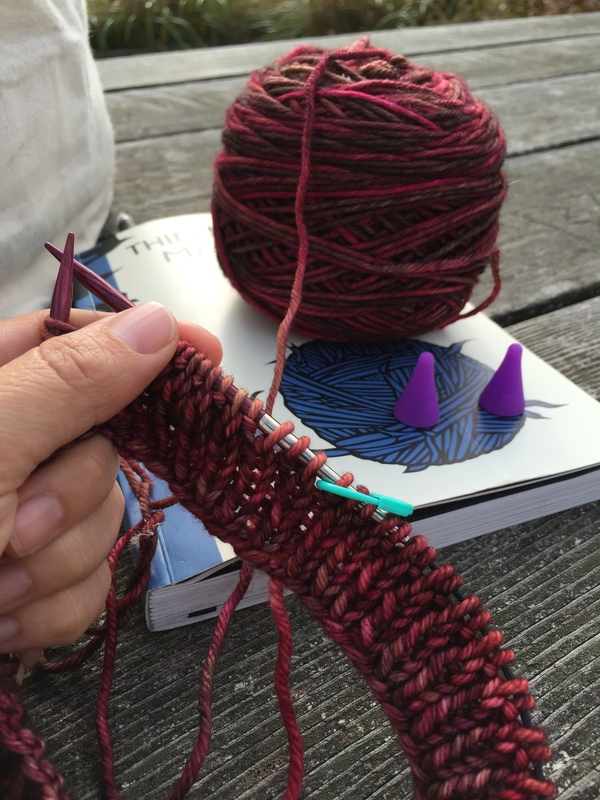 In the last few months, through the Wooful Podcasts, many countless websites and Instagram feeds, and most importantly a serendipitous re-connection with an old friend who is a knitting wizard, my world has opened to this fabulous fiber community. There is so much to learn; it’s terribly exciting. It’s given outlet to my desire for creative expression and handwork while meeting the demands of my daily life. It took a while but the knitting bug has bit hard; I’m officially hooked. My trusty Fringe Supply Co. Field Bag filled with a project or two comes with me wherever I go. 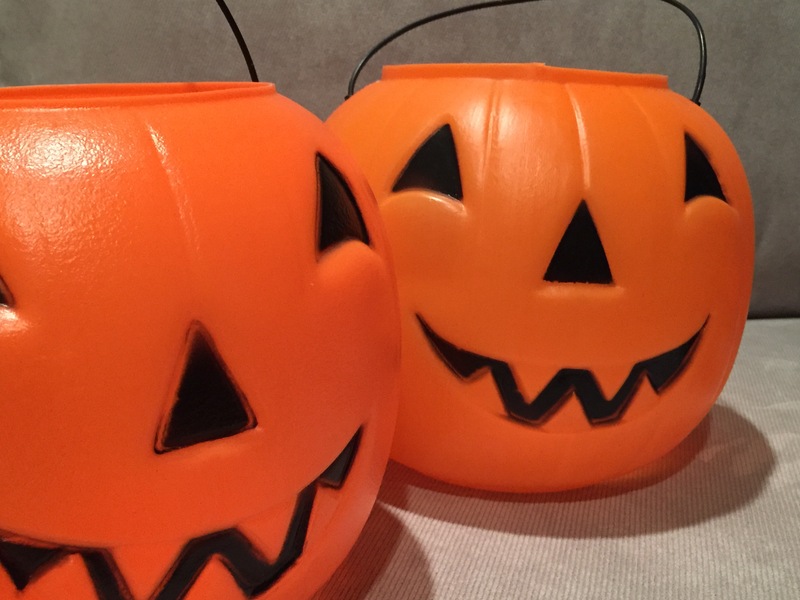 Another Halloween has come and gone and with it, the making of our annual costumes for the kids. S and I made the decision long ago (maybe even before kids) that we’d try to have the costumes mostly, if not all, handmade. And we’ve succeeded for the most part and I dare say, we’ve found a bit of a routine around it. Starting in September we start talking to the kids about what they’d like to be for Halloween. This year the answer was a BAT. A fruit bat and a vampire bat to be specific. I then scour the internet for possible patterns. I’m a novice sewer at best, so I like to find things that are doable but with a little challenge. 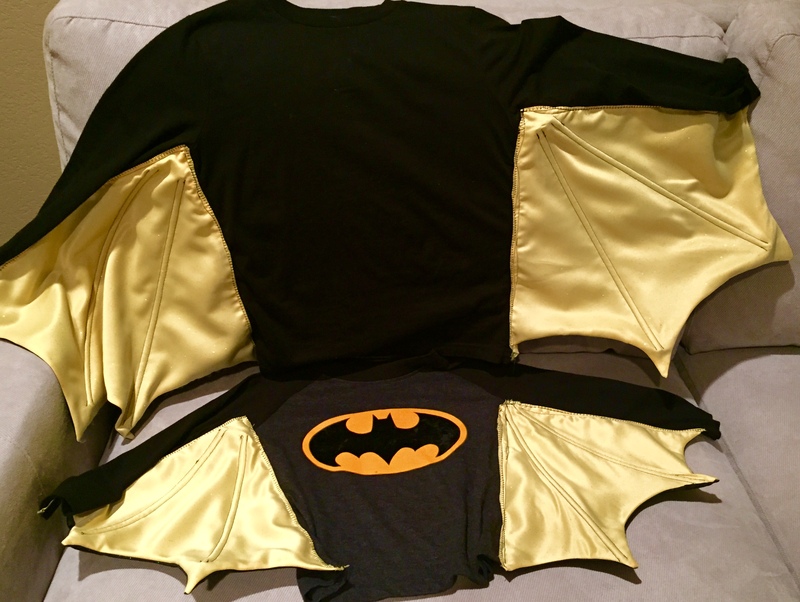 This year I found this great Do It Yourself Bat Costume by Ellen Luckett Baker for Alpha Mom tutorial and adapted it to make it our own. It was decided I would do the bat wings and S would do the masks. And this is key: I don’t like to convince my kids to be something or nag anyone to get their own part completed. There has to be complete buy in from everyone and that’s why we take the choosing of the costume and pattern slowly and seriously. 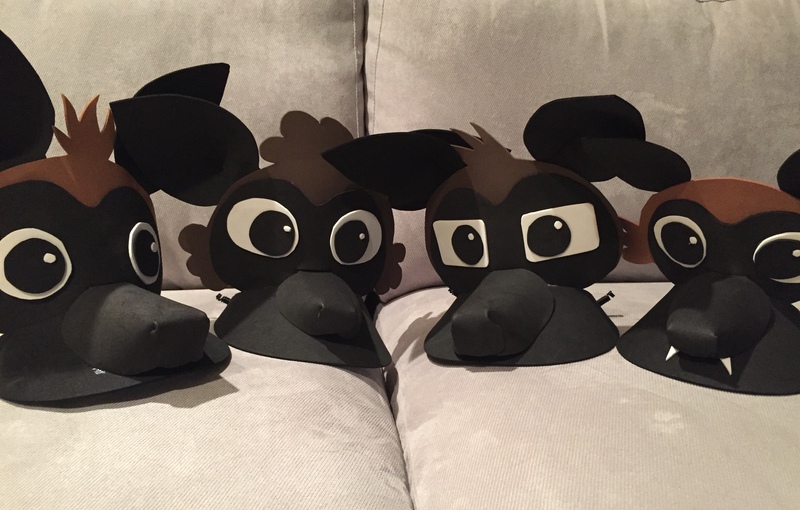 The added intention is that these costumes will become part of the dress up clothes for the entire year or more so the time we put into making them is all the more worth it. We are still using the Dinosaur Tales that I made 2 years ago. After choosing the costume and pattern it’s off to the fabric store with the kids. I let them pick out the fabric and help select the other needed details- steering them to think about if we have something at home we can use, can we go to the thrift shop, etc before buying it brand-new. Instead of the black felt the pattern called for the boys chose black and yellow glittery fabric. Once we gather all the materials we get set to working. Sometimes it’s been awhile since I’ve sewed when Halloween comes around and I need to refresh myself. 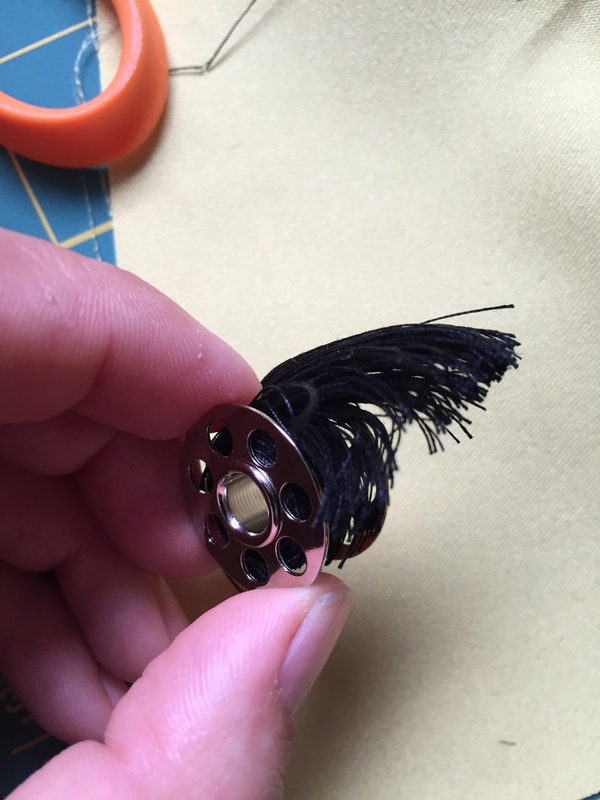 I had the hardest time threading the bobbin…until I looked at the instructions. 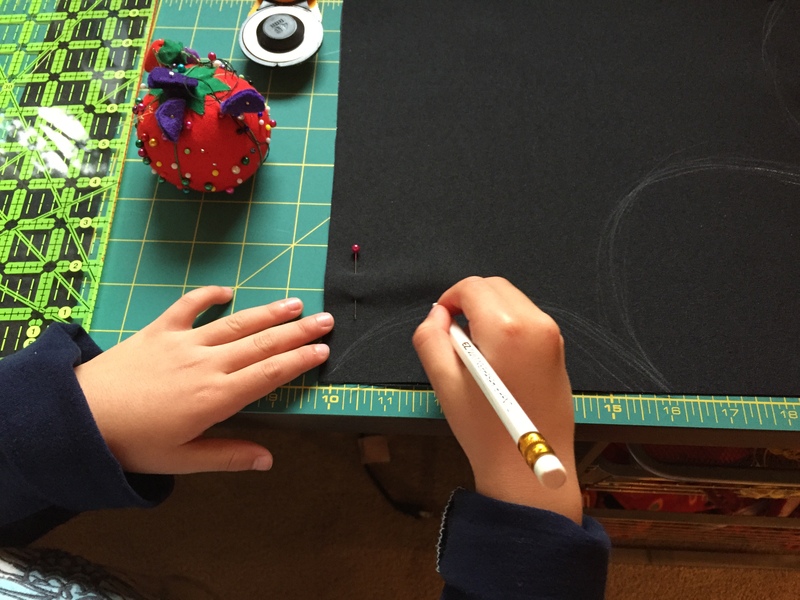 This year I started sewing two weeks before Halloween…can’t say the same for S but he tends to create his best work at the last minute. In the past I have left it to the last minute too, the creating becoming stressful and leaving no room for the kids to help in the process. It was a really fun process and of course, I figured out the best way to attach them to the shirt (a zig zag stitch) on the last wing. At least I know for next time we need some bat wings.